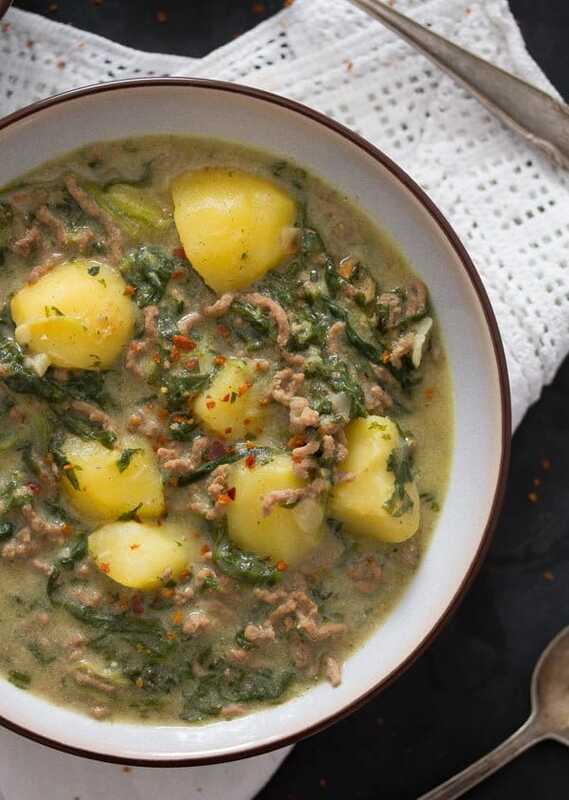 Comforting, easy to make and flavorful beef potato curry with spinach and yogurt. This beef yogurt curry is definitely one of my favorite curries. Not because it is better than any other curry I have ever made, I really make lots of curries and I have never made one that I didn’t like, but because this must be the first curry I’ve made myself. I discovered Indian food a bit more than 10 years ago, when my husband and I moved and lived in London for one year. I loved the food so much and I knew that the chances of eating Indian food were close to zero when we came back to Germany, so I bought myself lots of Indian cookbooks and scribbled down every Indian recipe I found in magazines and so on. Nowadays, we can even get Indian food around here in the remote German region where we live, but still I use the books I bought (got many more in the meantime anyway) and cook Indian food really often. 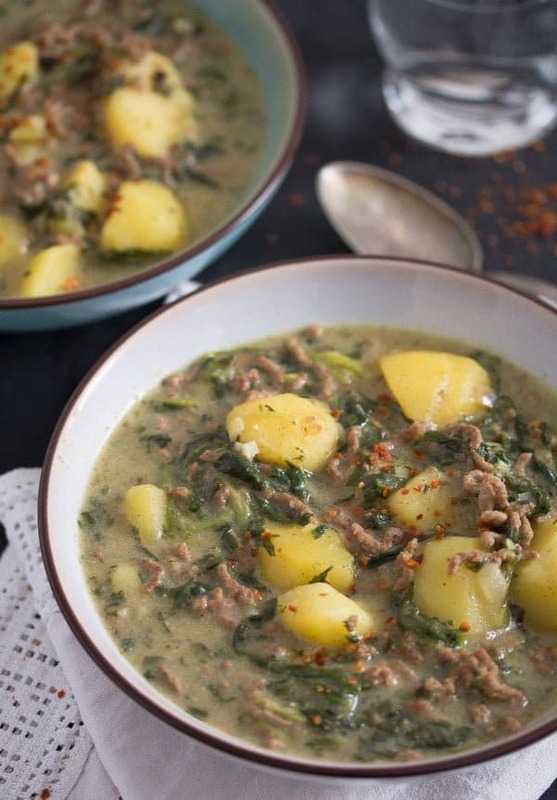 The inspiration for this curry beef stew is a recipe I wrote in one of my old cooking notebooks while living in England. It could be that I found the recipe in one of the Good Food magazines that used to be laying around the coffee room at my old workplace in London. I don’t really remember it, but it is probable. 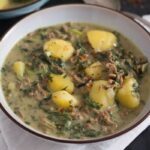 However, over the years I have changed the recipe here and there, really made it my own or our own, we all love this beef yogurt curry, even the children. It is really one of the few standard meals we have. The ingredients you need for this recipe are all pretty straightforward, simple ingredients, nothing fancy. Even the spice list, which can be so extensive in case of other curries, is pretty short in the case of this beef potato curry. So, let’s start with the spices needed for the beef yogurt curry. First of all fresh ginger and garlic. I have made the curry with ginger and garlic paste from a jar and it was fine, so feel free to use that if you happen to have it. However, I rarely have that, so I always use fresh ginger and garlic, which I grate on the fine grater. Then you will need some fresh red chili, the quantity you use is really according to your taste. If you don’t have fresh chili, you can replace that with a small dry chili or some dried chili flakes. Again, adjust the quantity according to your heat tolerance. I usually don’t make it that hot, the children are eating, and although they do like spicy food, I still don’t exaggerate with the heat in most cases. What you will also need is 1 tablespoon or so of curry paste. The original recipe calls for korma curry paste, but I don’t think I have used that particular curry paste once. I always use what I happen to have, and what I happen to have most of the times is green curry paste. To these spices you will add a generous amount of ground cumin and ground coriander and there you have it: the base for a spicy, flavorful, comforting and delicious beef potato curry. You will need some liquid to cook the beef potato curry. You can either use vegetable broth, chicken or beef stock. I usually take homemade chicken stock, because I almost always have in the fridge or freezer, but if I have forgotten to thaw it, then I use vegetable broth made from an organic vegetable stock cube or vegetable broth powder. 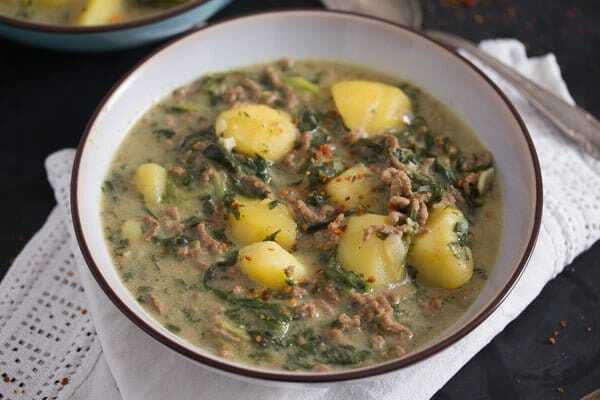 The main ingredients for this curry beef stew are, of course, the ground beef, the potatoes, spinach and yogurt. When it comes to the ground beef, there is not much to say. You can use regular ground beef or lean ground beef, the choice is yours. I have even used a mixture of ground beef and ground pork and it was delicious. The original recipe calls for new potatoes, unpeeled and halved, but usually I just take regular potatoes, which I peel and cut into rather large chunks. When it comes to spinach you could use either fresh or frozen spinach. For convenience, I use frozen spinach most of the times, fresh spinach is not always available and as you only need a couple of handfuls of it, it is really not worth buying it unless you already have other plans with the rest of the spinach. If you use fresh spinach, two large handfuls of it should be enough. 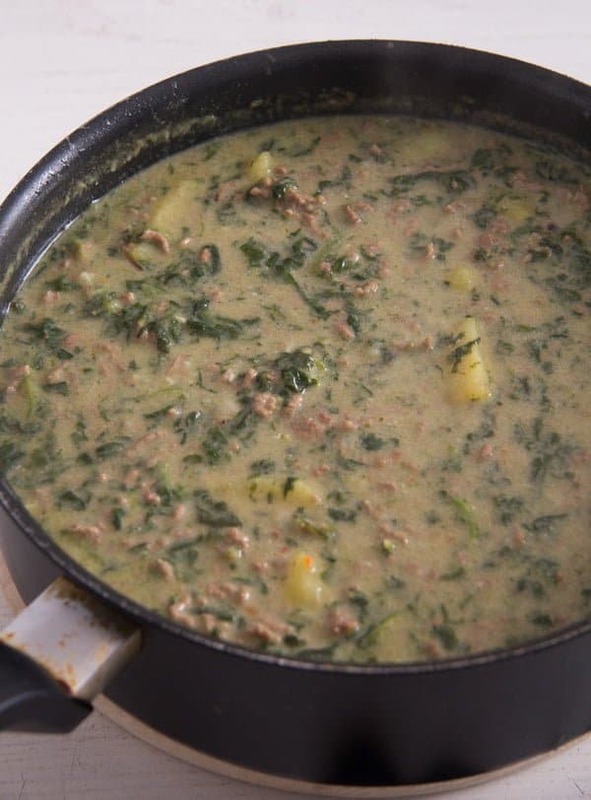 Give the spinach to the beef yogurt curry and let the spinach wilt in the pot. If using frozen spinach, you can let the spinach thaw and then give it to the pot during the last five minutes of the cooking time. 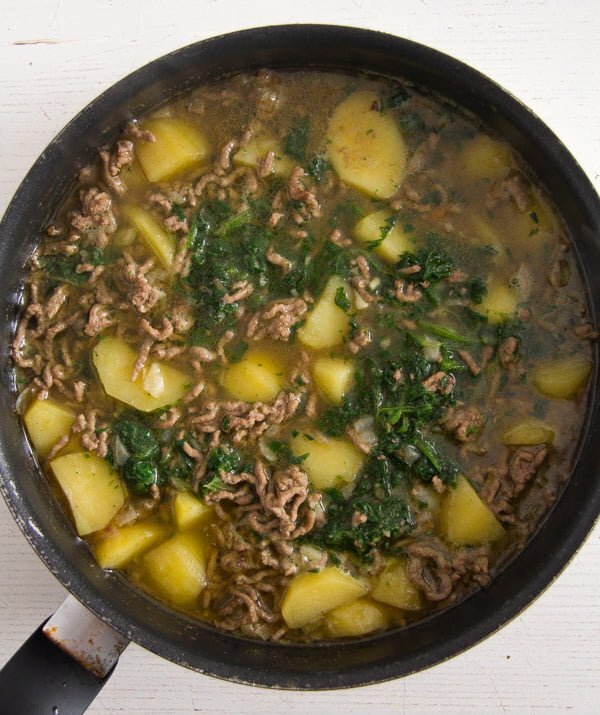 If you forgot to thaw the spinach, then give it to the pot when the potatoes are about half cooked and let the spinach thaw and get warm directly in the pot. However, this will mean that the curry beef stew will be a bit more watery in the end and you might have to adjust the taste again with more spices. So, it is preferable to remember to thaw and drain the frozen spinach. I use regular fat yogurt most of the time, but full-fat Greek yogurt (10% fat content) is indeed the best option. More fat, but also more creaminess. The choice is yours. I usually have to thicken the sauce with some cornstarch, especially if I let the frozen spinach defrost directly in the pot. It is recommendable (I like a creamier, thicker sauce), but not mandatory. We like crushing the potatoes on the plate with a fork and that also helps to get a thicker sauce when you are eating. Making this beef yogurt curry is very easy. Step 1: Brown the ground meat in a larger stew pot and remove it from the pot. Step 2: Cook the finely chopped onion for about 5 minutes, then add the grated ginger and garlic, finely chopped chili and all the spices. Stir fry for about 1 minute or until fragrant. Step 3: Return the meat to the pot and add the chunky potatoes and the vegetable, chicken or beef stock. Cover, leaving a crack open, and simmer the beef potato curry for about 30 minutes or until the potatoes are tender. Step 4: If using fresh spinach, give it to the pot during the last minute, it will need a very short time to wilt. 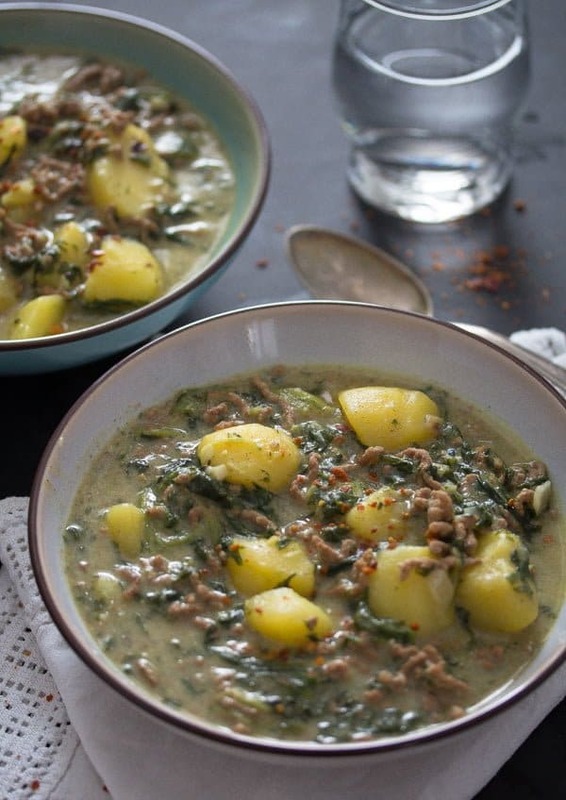 If using frozen and defrosted spinach add it to the pot about 5 minutes before the cooking time is over, so it will have enough time to warm through. Step 5: Thicken the sauce with some cornstarch. Give the cornstarch to a small bowl, add a few tablespoons cold water to obtain a thick yet pourable paste an whisk this paste into the simmering sauce. Let bubble once or twice. Step 6: Remove the pot from the heat and swirl in the yogurt. The best side dish is naan bread. I love mopping the sauce with the fresh bread. However, if I didn’t have naan bread, I also served the curry beef stew with regular bread, preferably crusty white bread, but normal sourdough would do as well. You can also make a salad on the side. A cucumber or carrot raita would be great as well. I have also served the beef potato curry with kimchi (really fusion food) or sweet and sour gherkins. We loved the combination. 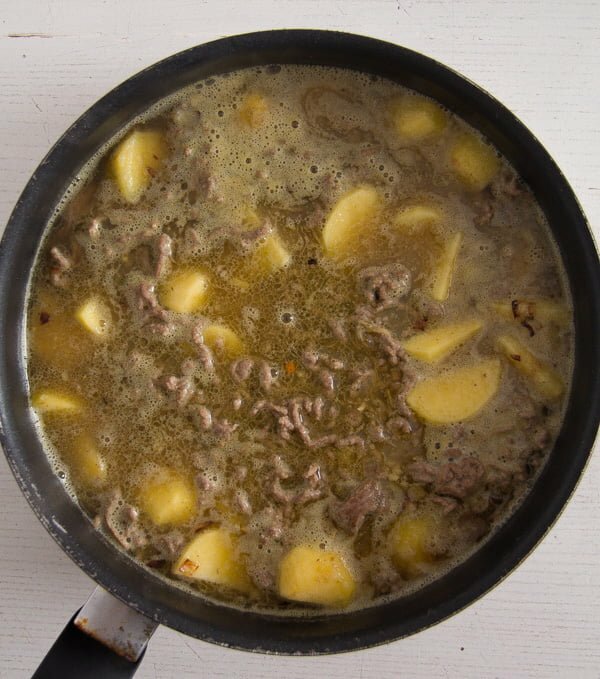 The curry beef stew can be easily reheated. Heat the oil in a larger stew pot or Dutch oven. Brown the ground meat for about 3-5 minutes, stirring often to break the lumps. Remove the meat from the pot. In the meantime, chop the onion very finely. Peel and cut the potatoes into larger cubes. Cook the onion in the pot without the addition of any fat, stirring often. Add the peeled and grated ginger and grated garlic, finely chopped chili (or chili flakes), cumin, coriander and green curry paste. Stir continuously for 1 minute. Give the meat back to the pot, add the cubed potatoes and the broth or stock. Bring to a boil and simmer for about 30 minutes or until the potatoes are soft. Cover the pot leaving a crack open. Add the defrosted and squeezed spinach during the last five minutes of the cooking time. If using fresh spinach, add it during the last minute and stir until the spinach is wilted. To thicken the sauce mix the cornstarch with about 2 tablespoons water in a small bowl. You should have a thick yet pourable paste. Whisk the paste in the sauce and let the sauce bubble once or twice until slightly thickened. Remove the pot from the heat and swirl in the yogurt. Adjust the taste with salt and pepper. Note 1: You can use a dried chili or about 1 teaspoon dried chili flakes instead. Adjust the quantity according to your taste. Note 2: You can use vegetable broth made with an organic stock cube for convenience. If fresh chicken stock is available, that is always the best choice. Note 3: The frozen spinach should be preferably defrosted and squeezed before you give it to the pot. The 200 g/ 7 oz refer to the spinach when still frozen, once defrosted and squeezed the spinach will weigh less. Note 4: If using fresh spinach, about 2 handfuls will be enough. Curries are one dish I’ve never made. 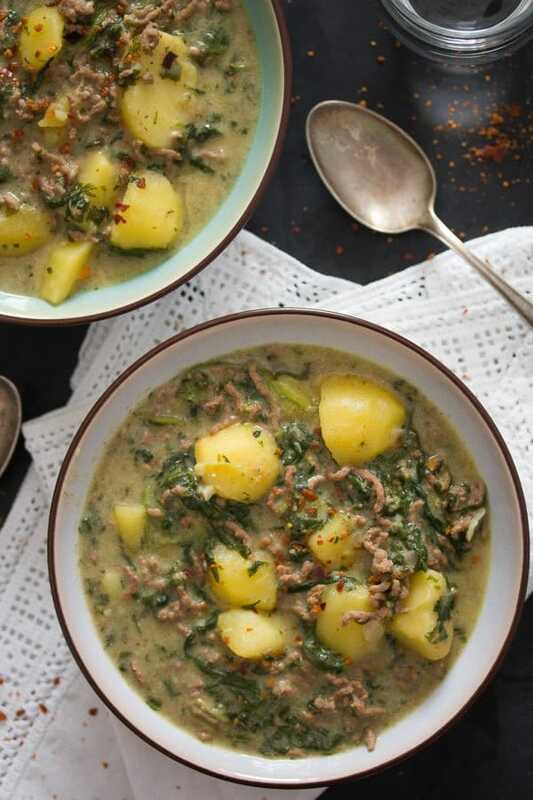 This looks like comfort food and would be perfect for these cooler fall days.